Family values have always been a constant theme throughout The Flash. With Nora’s arrival throwing Barry and Iris into parenthood so quickly, we see new parents trying to find their groove in striving to be perfect for her. Currently, it seems to be going well. Nora has finally taken a shine to Iris, the three aren’t fighting, and with Thanksgiving around the corner, everything seems to be perfect. Cicada hasn’t exactly been forgotten by the team. Barry follows up on a lead of a young girl, named Grace, who is in the hospital following the satellite disaster. Based on Cicada’s profile they believe he’s connected to her. He’s thrown off the trail by the same doctor who has protected Cicada thus far, and she warns the Meta hunter to stay away. With the upcoming holiday, Barry doesn’t pry into it any further. Thanksgiving opens up Cicada’s backstory and motivation for killing Metas. As Orlin, he was forced to become Grace’s parent after her mother– his sister– died from a Meta attack. He’s awful at the jo;, Grace acts out, and somewhere along the line, they grow into a supportive family unit. That is until the night of the satellite explosion that results in Grace going into a coma with brain damage and him with a shard in his chest. The attending doctor is very anti-meta and places all the blame on them. Before this, Meta-Human attacks have been isolated to the same storyline of them facing the Flash and eventually being captured and sent to prison. Rarely do we see the long-term effects on victims such as Grace and her mom. The doctor, most likely, isn’t the only one with bad opinions on Metas– who could blame her when she’s probably seen countless cases of injured children like Grace. Father-daughter relationships run rampant as this week’s Meta is introduced to be Weather Witch, daughter of Weather Wizard. She’s desperate to free her father from jail but is prevented by Barry and Nora. With the power to call lightening with her dark matter-infused weather vane, she threatens the safety of Central City until he’s released. The conflict is a catalyst for Nora facing the fear of losing Barry for good. He’s chosen to put his powers to good use, at the risk of losing his family. It’s apart of being a hero, and as much as it hurts losing him, this is a sacrifice he feels he has to make. Nora will soon have to face her own difficult choices as she branches out as hero in her own right. With Weather Wizard released, Weather Witch reacts by dropping a truck on him. It’s like every type of father-daughter relationships is depicted from good to bad. We don’t know why she despises her dad, but finding out he was a hologram and she was tricked into thinking was released, ticks her off far more. Nora and Barry quickly subdue Weather Witch before she destroys Central City just in time for Thanksgiving. 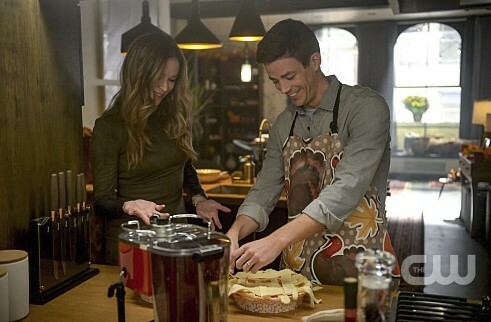 Team Flash gets to enjoy a nice meal with most of their crime-fighting family at the table. While Caitlin, Cisco, and Sherloque had a brief argument against celebrating, who could ignore such a delicious meal? Despite the lull in the story, we’re left with one treat: Cicada’s identity revealed to be Orlin Dwyer. As far as villain origin stories go, Orlin’s was far more engaging than previous villains. His motive for killing Metas is selfish, but considering his circumstances, who can blame him? He’s not looking to gain anything other than keep other kids safe from the same fate as Grace. Barry is a big softie, and with Nora in his life, I wonder if learning of Orlin’s motivation would change his mind.